Free discrete plugins replace bloated security plugins. – Get under 2-second load times on shared magnetic hosting with free plugins and themes. Free discrete plugins replace bloated security plugins. While studying site security and speed, we tested the iThemes Security plugin. It’s claimed to prevent malware injection. We’re sure it works but the plugin is major overkill. We duplicate it’s core features with lightweight, fast-loading, standalone free plugins. Beneath the surface, this large, 3.1M plugin contains a lurking, greedy speed bite. Chomp! ut iThemes Security plugin only adds a mere 36 milliseconds. Measured with GoDaddy’s P3 Plugin Performance Profiler (100,000 active installs). Using Pingdom.com, there’s no detectable difference in load time. With this security plugin onboard, there’s not even an extra call (HTTP Request). The plugin appears pretty safe and benign for speed. And it’s popular! (800,000 active installs) What could go wrong? iThemes Security, WordFence, and Sucuri Security are all popular security plugins. That’s an immediate red flag that they’re slow. Why? It’s crazy. But the speed results for popular plugins always turn out slow in tests. Same for themes. People just go for the heavy plugins loaded with the most features. Overkill. The herd starts following the path thinking active installs must mean goodness. Nope. Remove and add substitute recommended discrete plugins. Change your WordPress login password to anything that has a total of 16 characters, numbers, or symbols. Make it lower and upper case for a few characters. Increase the login failures to 17. Yes 17 is good enough. Change the prefix to something other than the default “WP_” such as “AS_” or something random. It uses too many server resource and slows down the server. It’s a complicated plugin. The above 3 discrete plugins will suffice for security and speed. Nowadays, there’s a herd-panic or paranoia about WordPress security and getting hacked. It’s easy to get caught up in the frenzy – and go plugin crazy. All that’s required are a few simple things. First, change your login from the default “admin.” Duh? Use something a little more challenging for bots. Don’t use “password” as your password. These are obvious right? Right. Then add a plugin to prevent brute-force attacks. The 5-year-old plugin solution is Limit Login Attempts (2 million active installs). But WP Limit Login Attempts (30,000 active installs) is fresh and up to date. (They’re OK. They work. But, we don’t use either of these two on PagePipe). instead we now use, Limit Login Attempts Reloaded (40,000 active installs). It works with PHP version 7.1. PagePipe uses the following simple security plugins. We predict load time in milliseconds using P3 Plugin Performance Profiler (by GoDaddy). NOTE: P3 plugin will slow down your site. Don’t leave it installed! Brute-force attacks are the simplest method to gain access to a site. The hacker tries usernames and passwords, over and over again, with a “bot” until they get in. This lightweight plugin prevents brute force login attacks using .htaccess. .htaccess is a configuration file on web servers running Apache Web Server software. Time-limited number of login attempts block the hacker’s IP address. Protect your website from SQL injections. Replace your database WordPress default prefix (WP_). Use any other alternative prefix in a single click. An SQL injection is a computer attack. Hacker’s can embed malicious code in a poorly-designed applications. Then pass it along to the backend database. Anything can then happen on your site. A lightweight plugin to protect email addresses from email-harvesting robots. The plugin encodes addresses into decimal and hexadecimal entities. No configuration required. A simple, super-fast plugin that protects your site against malicious URL requests. Hackers can redirect user requests from your site to an illegitimate site. No plugin configuration required. After installing iThemes Security plugin, we got a GoDaddy email notification. It said our hosting account exceeded its resource limits. 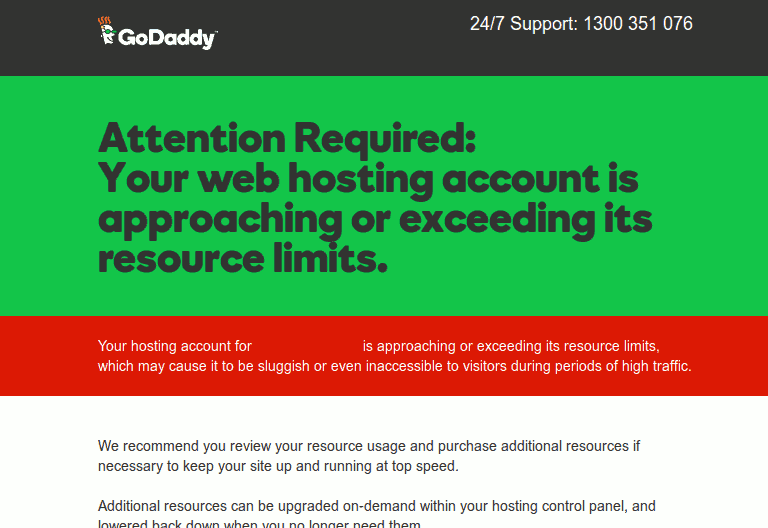 Email warning from GoDaddy hosting (shared Linux, magnetic drives). The recommended solution by our benevolent host, of course, is buy more server goodies. But the better answer – they don’t tell you – is simpler and cheaper than that. After the “warning,” we checked Cpanel (CPU and Concurrent Connection Usage). It said RAM usage jumped from 89M normal to the 512M maximum available. We’d never encountered this problem before. The “spike” in the Cpanel Memory data occurred when we installed the iThemes plugin. We completely uninstalled that nasty security plugin. Ram usage immediately began dropping down. An hour later the RAM usage was 221M. By 1.5hrs, it was 128M. We were finally drifting back into the green zone. Are we the only ones to ever see this weirdness? No. Read on. When you exceed server limits, many hosts at least will start throttling your site. Or worst-case, take your site offline for hours to days. They claim they’re protecting other sites hosted on the server from your malfeasance. You’re dragging everyone else down with you. Bandwidth throttling is the intentional slowing by your Internet service provider. This helps limit network congestion and server crashes. But it’s also often a lame excuse to justify poor performance. And sloppy cramming of thousands of domains on a server. You can’t control this. But you can avoid memory-hog plugins – like iThemes Security. Is iThemes Security the Lone-Ranger plugin that consumes RAM? Nope. There are a bunch of plugins we know of (and many others we don’t). But they aren’t security plugins. Checking broken links one by one is not physically possible, even for a small site. There are many free and paid tools that check for broken links. You can get the Broken Link Checker plugin (active installs 500,000) and check the health of your links with it. But Broken Link Checker is a RAM hog. You’ll see two spikes on the graph below. The first is when we switched on Broken Link Checker and it started it’s automated crawling of the site. The second peak is UpDraft Plus (1 million active installs) doing an automatic site backup. We keep Link Checker deactivated and only run it once a month. What if you’re running Link checker? And doing a backup? And have a hog security plugin running all together? You’re doomed. What can you do!? Click it. You’re taken to a dropdown menu. There you can select the version of PHP (Hypertext Preprocessor), a server-side scripting language. This is the code used to run WordPress. Our PHP version was set to 5.3. We reduced WordPress memory usage by upgrading from PHP5.3 to PHP5.5. The newer versions compress better and run faster. And this speed improvement is free. Version 7 is the latest and greatest. And supposed to really be fast – but not all hosts provide it yet. How much improvement did we see? Changing the PHP version reduced RAM usage by 20 to 30 percent. This keeps us safe. Now we idle around 70M. We’re staying far away from the 512M rail. But when we do daily backups, we push up to around 300k usage. We improved this with better backup plugin settings. We could do manual backups when we create new content. But instead we compromise and switch from daily to weekly backups to reduce the load. That works for us. Want to complicate your life in the name of absolute security so you can pass an odd security test? Like https://securityheaders.com/ Try one of the futile header modification plugins below. We’re not using them. We tested them and found them over the top in complications. We accept our a big fat “F.” Do we care? Content Security Policy prevents content injection attacks by specifying valid sources of content for a site. This Content Security Policy plugin will help the setup the Content-Security-Policy HTTP response header and block the XSS vulnerabilities. Eazy HTTP Headers provides three check boxes for settings on the general settings page. Two of the check boxes, activate two functions built into WordPress, send_frame_options_header() & send_nosniff_header(), while the other sets a header for X-XSS Protection. This allows you to control your sites HTTP Headers for X-Frame-Options & X-Content-Type-Options using functions built into WordPress functions. The Eazy HTTP Headers Settings section is on the general settings page. HTTP Headers gives your control over the http headers returned by your blog or website. Set up header instructions included in the HTTP protocol for website security improvement. Advanced HTTP security header optimization toolkit. Content-Security-Policy, Strict Transport Security (HSTS), Public-Key-Pins (HPKP), X-XSS-Protection and CORS. The plugin provides Content Security Policy Management with support for Reporting API and legacy policy conversion based on browser sniffing. The plugin supports most security headers, including Strict Transport Security (HSTS), Public-Key-Pins (HPKP), X-XSS-Protection and all Cross-Origin Resource Sharing (CORS) related headers (Access-Control-Allow-Origin). the webserver config, .htaccess or lack mod_headers type facility. Block XSS vulnerabilities by adding a Content Security Policy header, plugin receives violations to easily maintain the security policy. Content Security Policy (CSP) is a W3C guideline to prevent cross-site scripting (XSS) and related attacks. XSS allows other people to run scripts on your site, making it no longer your application running on your site, and opens your whole domain to attack due to “Same-Origin Policy” – XSS anywhere on your domain is XSS everywhere on your domain. CSP tells your browser to push least-privilege environment on your application, allowing the client to only use resources from trusted domains and block all resources from anywhere else. This plugin will help you set your CSP settings and will add them to the page the visitor requested. Policy violations will be logged in a database table which can be viewed via an admin page that supplies all the violations, along with counts. Buttons easily allow you to add the sites to your headers or to ignore them. This plugin also allows you to ignore sites that repeatedly violate your policies. For example, some tracking images will show as violating your policies, but you still don’t want them to run, therefore you can block the site from showing up in your logs – note, however, that the browser will still call your server and your server will still spend resources processing the call. Previous PostPrevious Google Maps and mobile WordPress speed.